Okay, I get the idea (after all of 2 issues): Adventure Comics is going to have little stories about the Legion of Super-Heroes past (well, relative to the regular Legion comic). This is too trivial for me to care about, especially since the Paul Levitz Legion has never been all that to me. (The Jim Shooter Legion it ain’t.) This issue especially annoys me because I’m dreadfully tired of Brainiac 5 being portrayed as essentially a cranky old Vulcan. I also loathe the faux-Russian speech mannerisms of the Legion’s late benefactor R.J. Brande here. Bad stuff. This issue also had an Atom back-up that lost me after about 2 pages. This series isn’t worth bothering with, so I’ll be sticking to the main series from here on out. 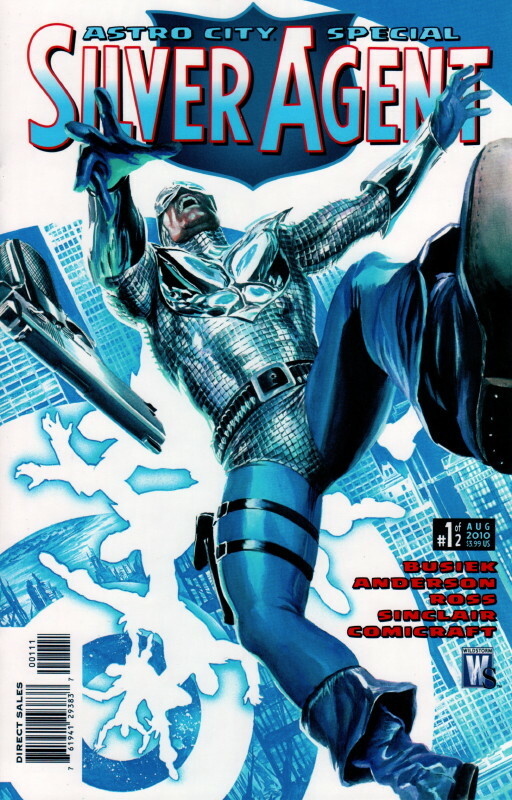 On the other hand, the new Astro City is a 2-parter focusing on the Silver Agent. The Agent was introduced early in the series via a statue of the man with the words “To Our Eternal Shame” on the plaque. We saw more of him in The Dark Age as his fate marked the end of the silver age in Astro City and the beginning of that dark age. But that wasn’t the end of the character. In a nutshell, you could describe the premise of the character thus: What is Captain America were framed for murder, and was executed (with the public’s approval) before the truth came out? But what if just before the execution, he was rescued by the Legion of Super-Heroes, who pulled him forward to the future to help them in a war of their own? And what if he then had to weigh the decision to live the rest of his life in the future, or to return to meet the fate history had laid out for him? That’s this issue (along with his origin). And it’s really good. The Dark Age felt like it meandered around too much, and this issue feels like it’s getting back the focus the series has otherwise always had. Next issue, well, I’m hoping Busiek and Anderson knock it out of the park, because it’s what we’ve been waiting for for a long, long time. Getting back to the chaff, J. Michael Straczynski’s The Brave and the Bold has been generally pretty bad, although seeing Jesus Saiz develop as an artist has been nice. 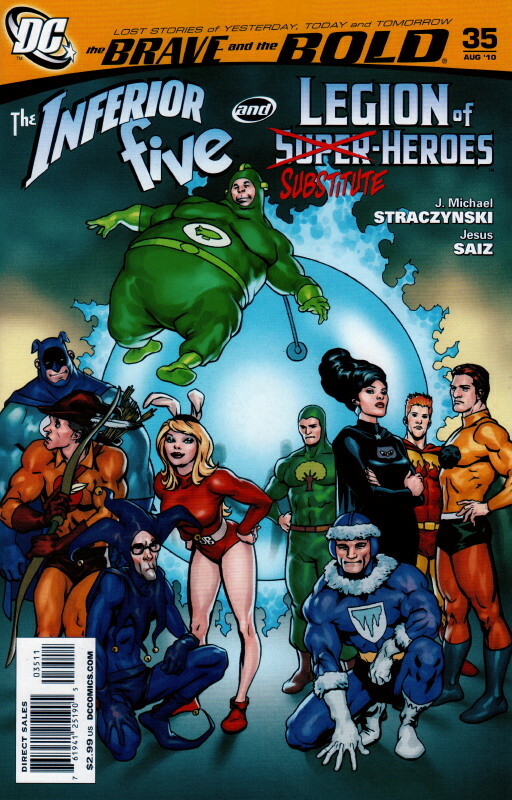 But this issue is awful, as the Legion of Substitute Heroes and the Inferior Five “team up” to try to save the world – from the same menace the Legion of Super-Heroes and the Doom Patrol saved it from last issue, explaining a few mysteries from last issue. It’s supposed to be funny, but it’s anything but. It’s actually rather embarrassing. I’m not really sure why people think the Subs are best used as comical figures, since every attempt to write a funny story with them has been just awful. 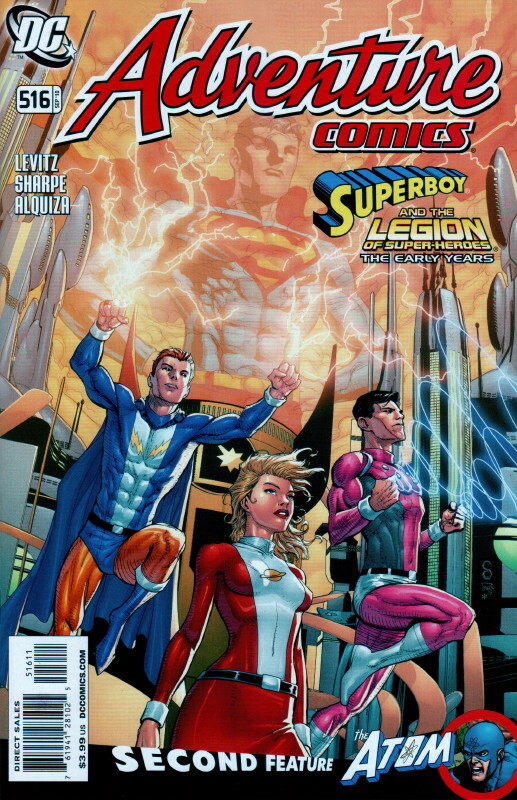 They were used much better in Geoff Johns’ “Superman and the Legion of Super-Heroes” story a couple of years back. Sure, they’re second-stringers, but in a sense that just means they have to try harder. Making fun of them is, well, no fun at al. As for the Inferior Five, well, if ever there was a joke whose time has long since passed, they’re it. I don’t think I can stand any more of this series, so I’m hitting the eject button. 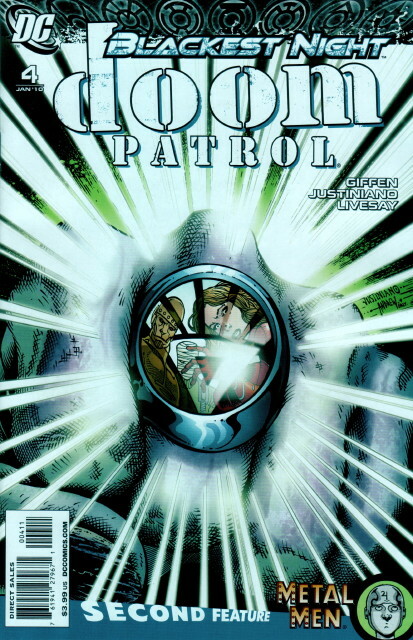 In a way it’s too bad, because the first year of this series, by Mark Waid and George Pérez, was excellent (especially the first 6 issues), but it really went downhill quickly after that. Nothing really memorable other than the Green Lantern/Spectre issues, which were enjoyable enough. 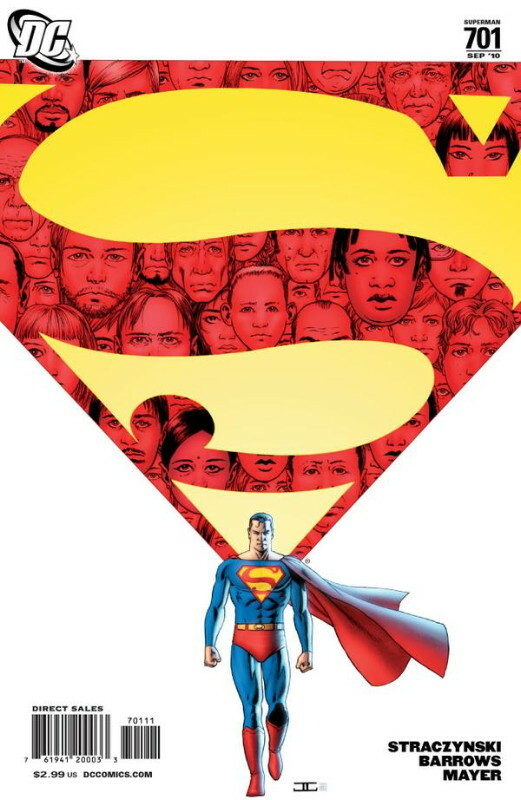 And speaking of J. Michael Straczynski, Superman #701 is the real first chapter of his series “Grounded”. Superman doesn’t entirely stay on the ground, but he walks across the country to interact with people on their level. It’s basically full of Straczynski clichés: The slightly-too-sentimental rescues, the humor that fails badly, the out-of-place and rather tedious philosophical asides. It’s not quite as bad as all that, but it feels downright trivial, and very much unlike a Superman story. As I said last month, I don’t think Straczynski really gets superhero comics, since none of his really seem to work (other than The Twelve, in which the fact that the characters were superheroes was almost incidental to the story). The story will need to shift in tone sharply next issue, because this premise as depicted here just doesn’t have legs (so to speak). John Cassaday’s cover has been getting a lot of favorable reviews, but I think he’s done much better work. The composition is nothing special, and it looks like there’s something wrong with Supes’ head and neck. A larger disappointment has been the new Age of Reptiles mini-series. The first two series were great stuff, telling actual stories about dinosaurs without anthropomorphizing them too much (just enough to make them a little more sympathetic – or not – to the readers). You could argue that Ricardo Delgado framed everything to make a story out of it. But The Journey has been more a series of vignettes, without an actual story. Or if there was one, then it was too subtle or too buried for me to pick up on it. So although lavishly illustrated, it hasn’t been a very satisfying read. I got to the end of this issue and scratched my head wondering exactly what the point was. Okay, drawing dinosaurs may be a point in itself, but really this was a big letdown compared to the first two series. 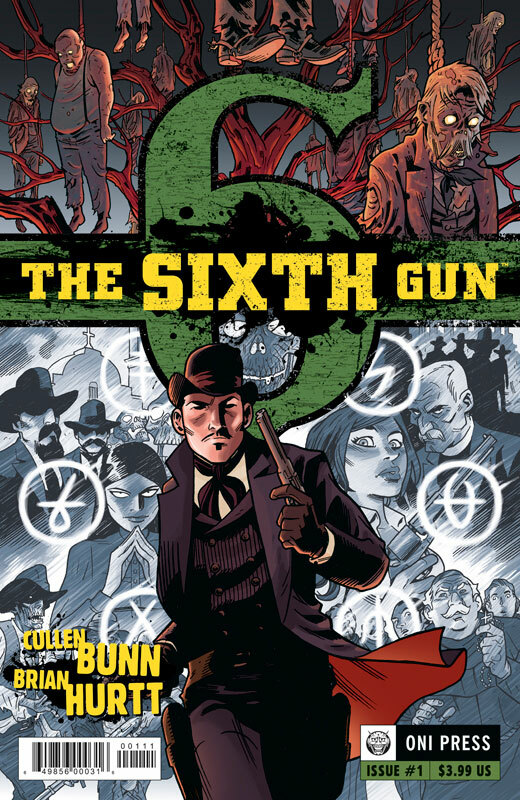 Finally, The Sixth Gun premiered as a Free Comic Book Day giveaway, and the first two issues both came out this week. (The first issue is essentially identical to the FCBD issue.) 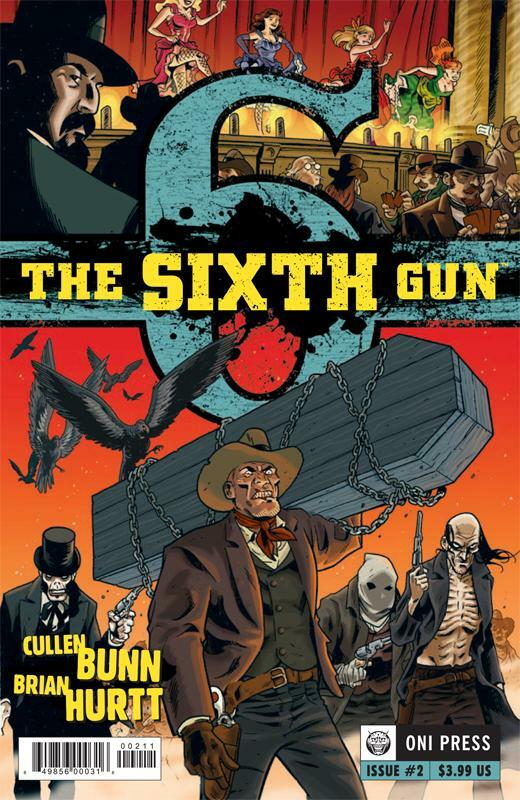 It’s quite good, being a supernatural horror story set in the old west: An old Confederate general is raised from the grave (if he ever really went there in the first place) and wants his gun back. But his gun is bonded to the daughter of the man who stole it from him, and she’s being spirited away by one of the General’s former posse, whose motivations are still murky. There’s violence, mayhem, dark magic, ghosts, and all kinds of good stuff, and Brian Hurtt’s art is excellent, expressive and nuanced despite his fundamentally simple style. Overall this is a nice package and a fun read. I’m looking forward to more. I admit it: I’m a sucker. I signed up with my comics shop for DC’s Blackest Night promotional ring giveaway. It’s not like I don’t have enough random crap around my house that I need a bunch of plastic rings, but something about the idea appealed to me just enough to sign up. The catch is that I’ll buy single issues of a bunch of comic books I don’t usually buy, so we’ll see if any of them are good enough to me to keep buying them. And you get to go along for the ride with me! And I’m far from the only one jumping on this bandwagon: Lots of other people have, too, which means a big sales spike for some DC titles. Which probably means more of this promotional gimmick in the future. But that’s okay, I don’t have to buy into any more of them if I don’t want to. Doom Patrol is the latest incarnation of the venerable Silver Age comic featuring normal people who acquired super powers which made them outcasts from the rest of society. At its best, the series plumbed the depths of this premise better than its Marvel counterpart, The X-Men; at its worst, it was routine superhero fare. Not a bad legacy for a book that was – aside the bizarre Grant Morrison run in the 80s – a B-list title. But as with many such titles from DC, the book has a history so convoluted I really can’t figure out its continuity, including a re-launch by John Byrne (which I skipped) which seemed to throw all previous continuity out the door (which, honestly, is fine with me) and return to the original cast of Robotman, Negative Man, Elasti-Woman and the Chief. Apparently Infinite Crisis restored the team’s previous continuity, which makes absolutely no sense to me, and it appears from the Wikipedia article that DC went to greater-than-usual lengths to explain away the inconsistencies. Sigh. So this issue – which features the deceased members of the “new” Doom Patrol of the late 70s coming back to fight the “new original” team of this decade – makes my head hurt, since I understand just enough of the continuity to know who these people are, but not enough to be able to make any sense of how these two teams could coexist in their current state. Would it be easier for a new reader to make heads or tails of this book, or harder? I really have no idea. Is the story any good? Well, it’s not awful, but it’s little more than a collection of disparate fights, and I don’t have enough attachment to any of the characters to feel the emotions that I’m presumably supposed to feel about the dead characters coming back, and honestly the main Blackest Night title has pretty much gone the distance with that premise anyway. The issue ends on a cliffhanger which is interesting enough that I just might buy the next issue, but it’s a close thing. As an introduction to the series, this issue isn’t a very good one. The art by Justiniano and Livesay (what is it with single-name artists these days, anyway?) is pretty good, solid, dynamic, stylistic enough to grab my attention, especially in the last two pages. If you like Doug Mahnke’s or Ariel Olivetti’s art, you’ll find the art here to your taste. So I can’t recommend Doom Patrol #4 for anything more than the promotional ring. 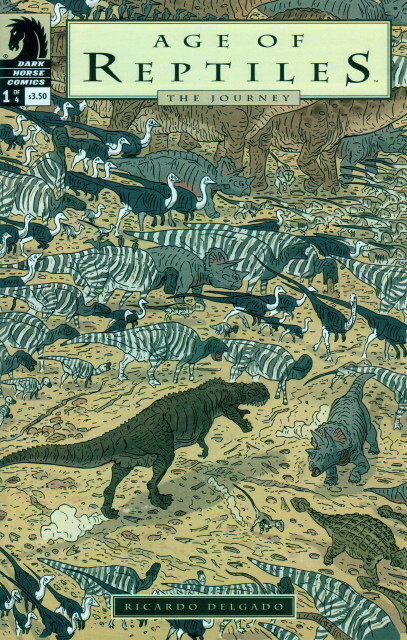 Ricardo Delgado published two Age of Reptiles mini-series a decade or so ago, and as an unreformed childhood dinosaur lover, I loved them. They’re serious “this is what it could have been like” stories of the giant lizards hunting, eating, fighting, protecting their young, only a little anthropomorphized to give the story a plot. Delgado’s artwork brings the creatures to life like nothing else I can recall seeing. They’re well worth seeking out. Now the reptiles are back in The Journey, the first issue of which has left me slightly baffled. 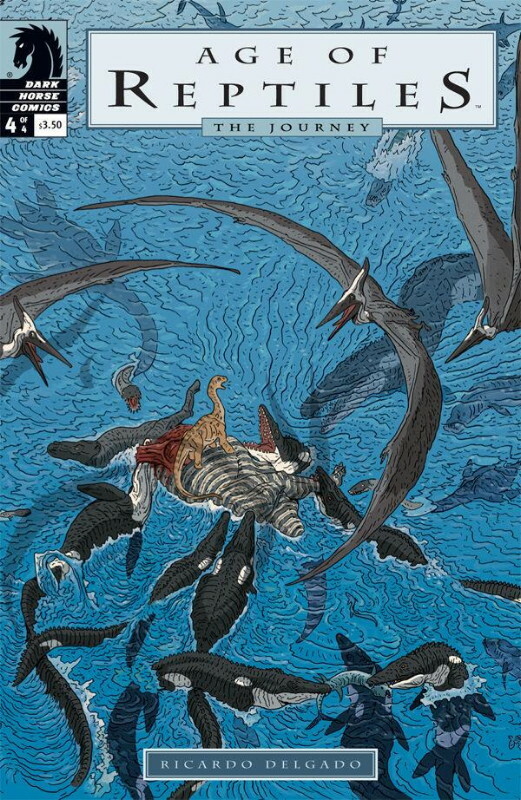 As you can see from the cover to the left, all the animals seem to be heading somewhere, and there are hints inside that they might be looking for warmer climate as the earth cools, and the mix of beasts could be from the late Cretaceous period. But the story seems a little buried in the set-up. Still, as I recall from the first two series, it’s the whole that matters, not just the individual issues. Delgado’s art is still great, although it seems a little less detailed than in the past. Maybe my expectations for this series were so high that I was bound to be disappointed by the first issue. But I’ll still be picking up the whole thing, so check back in a few months to see if the whole outweighs the sum of the parts. I’ve been on the Hellboy bandwagon for so long that I guess I’m just jaded. Some of the stories are very good, most are okay, few are bad. When push comes to shove, Witchfinder is closer to the “bad” end of the spectrum. Sir Edward Grey was a (fictional) occult investigator in the Victorian era, much like Hellboy in the 20th century. 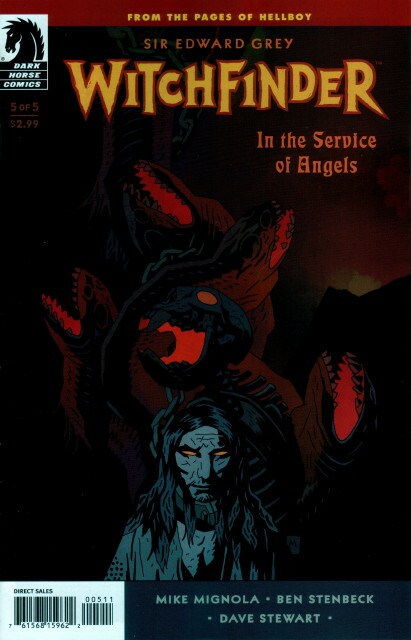 His adventure in this 5-issue series just didn’t make a lot of sense to me, trying to stop a demon killing people in London by reuniting it with its bones, and with various occult stops along the way. The story was too convoluted for me to sink my teeth into, and there wasn’t a single character worth caring about. Overall I think the series was just too clever for its own good, and it lost sight of telling a good story. John Byrne’s Star Trek Romulans series apparently comes to an end this month, a bit to my surprise as I’d thought this was going to be another 5-issue series. As I’ve said before, Byrne’s telling easily the most entertaining Star Trek stories I’ve read in years, maybe decades, and he has the visual look of the classic Trek series down pat. His Romulan story has been a shadow history of the Klingon/Romulan alliance implied by the third season of classic Trek. The Hollow Crown described how the Klingons engineered the death of the Romulan Emperor to put their own puppet on the throne to get around the Organian Treaty forced on them with the Federation. 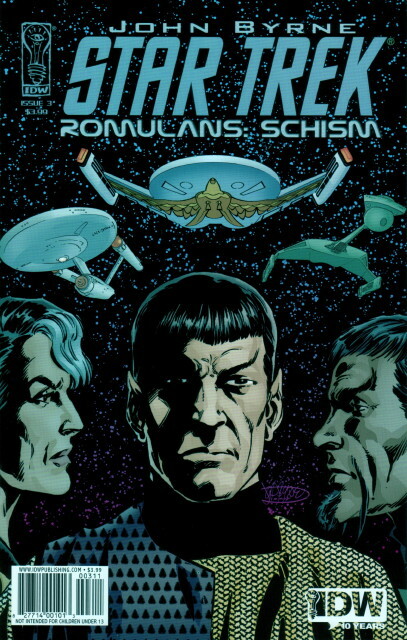 Schism is the other end of that story, as hostilities among the Klingons, Federation and Romulans come to a head in a fairly nifty (and wonderfully well-illustrated) space battle. The only real downside to the story is that it ends rather abruptly, with a literal deus-ex-machina with no believable explanation for why it didn’t arise previously. The story ends seemingly setting up yet another arc in the same storyline, but I understand this is the last chapter, so I’m not quite sure what’s going on. That’s really the achilles heel in Byrne’s Trek stories: They’re entertaining, but the endings are abrupt, ambiguous, and/or perplexing so it’s hard to see what the point of the story is. It’s frustrating, even as light adventure fare (which after all is what Star Trek is). All the pieces are intriguing enough that if Byrne keeps writing ’em and IDW keeps printing ’em then I’ll keep publishing ’em, hoping that eventually all the pieces fall into place and he produces a truly great one.